Use this design sheet to help you create the perfect Tuscan landscape. You'll get ideas for color, décor, materials, plants and fabric. It is a great starting point for any landscaping project. The Tuscan style of landscape mixes iconic plantings like lavender, rosemary, and Italian cypress with the warm colors of terra cotta urns, natural stone and bold flowers that stand out against the bright sunshine. Gabriel Frank, landscape designer and owner of Gardens by Gabriel, has been designing in this style for many years. The colorful yet waterwise plants of the Mediterranean suit both his design aesthetic and his desire for sustainability. Here are his professional tips for designing a Tuscan-style landscape. Do choose traditional Tuscan garden plants like olive trees, bay trees, old knobbly grape vines, and Mediterranean herbs such as lavender and sage. These plants bring the sensory experience of Tuscany to your garden with their fragrances and usefulness in the kitchen. Do choose warm colors of stone and patio materials. Decomposed granite, Santa Barbara cobble, and gold granite are a few good choices, but you can select whatever stone is available locally as long as the color feels warm rather than gray. Do amend new planting beds with two inches of compost to give plants a good start. "Even drought-tolerant plants like Tuscan herbs benefit from compost and regular water when first planted, " says Frank. Don't select pale or pastel colors like baby pink. These tones look washed-out under the hot midday sun. Brighter colors like red, orange, hot pink or yellow create a stronger contrast with the flower colors and silvery foliage of traditional Tuscan plants. Don't go overboard on the succulents. While succulents are both beautiful and sustainable, they don't bring to mind the agrarian roots of the Tuscan planting style, so should be used sparingly if at all. Don't use gray gravel, concrete or rock. Slate and other types of blue-gray stone can be successful in other types of garden, but the Tuscan style is all about warm earth tones. Don't be afraid to exchange your water-hogging lawn for a colorful Mediterranean-inspired landscape. "An established landscape uses half as much water as a lawn, and takes so much less care, " Frank points out. "Plus, creating garden rooms or different environments makes your space more versatile and fun to use." Many people develop an interest in the Tuscan theme because Mediterranean plantings are both low-maintenance and waterwise, and this combination of sustainability and beauty is one of the hallmarks of Frank's design style. He suggests rainwater capture, greywater harvesting and lawn replacement as other effective ways of making the most of the water you have. 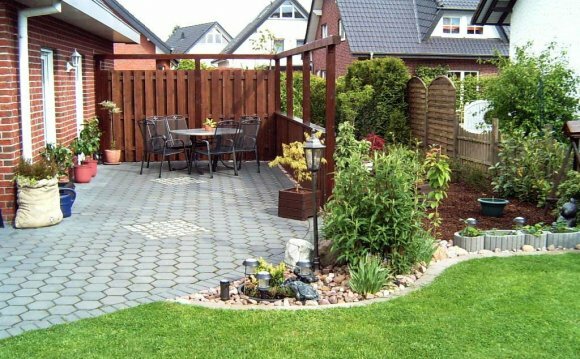 All of these elements can be designed into the landscape in a stylish and attractive way. Using ornamental varieties of edible plants within the landscape is another specialty of the Gardens by Gabriel team. "You can provide delicious foods and flavors for the whole family, " he points out, "while reducing the number of trucks on the road, avoiding pesticides, and reducing your carbon footprint." Edible plants tie in well with the Tuscan theme, because so many of the traditional Mediterranean plants are edible herbs or fruit.